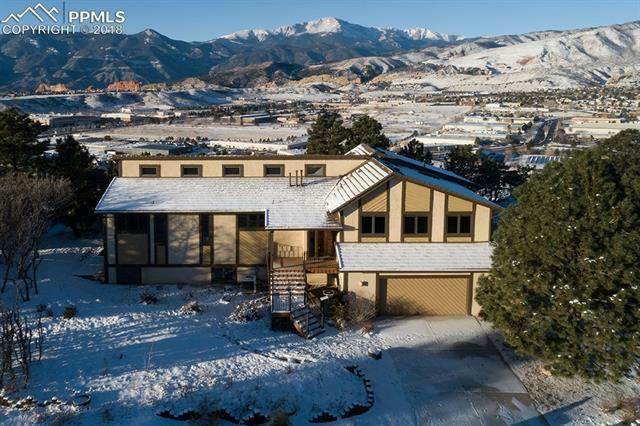 Beautiful well maintained home with breathtaking views from both luxury windows and large comfortable deck facing Pikes Peak and Garden of the Gods. Adding to the extravagance, are automatic blinds in the main living area beside the cozy stuccoed natural gas fireplace. That, with the large vaulted ceiling and ceiling beams, add a warmth to the home that is hard to beat. Roomy built in planter with water spigot and skylight above, top off the ambiance of this main living area.